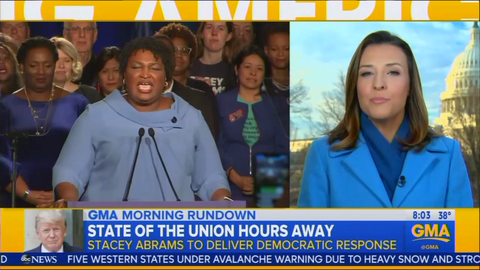 ABC couldn’t stop gushing over the Democrats attending the State of the Union tonight, on Tuesday’s Good Morning America. Congressional correspondent Mary Bruce even ludicrously called failed candidate Stacey Abrams, a “rising star,” hoping that she might run again in the Senate. ABC also touted the Democrats inviting illegal aliens and activists to the annual address, but failed to mention any of the guests invited by the White House.